May still has problems but for most cases it should be working(at least was tested on beta), if not, clearing old setting by killing(and backup) XPerlxxxxxxx.lua in the WTF directory of your WoW installlation and try again with fresh new default setting, thanks your patience. If still someone want to help Zeksie for he earns his donates from X-Perl then that's fine for Zek and X-Perl, but seems like it's time to cut him out as no one want to help X-Perl anymore (as many of users already heard about the mess of this poor addon), I guess. Please use the Ticketing System on WoWAce Here and avoid posting bugs using comments on Curse because they're difficult to track and they will probably get lost. Use a good error catcher (like BugSack from files.wowace.com) and provide the full error text, and give as much information as possible to recreate the problem. Don't assume We know what you're talking about with some three word report. HoT Monitor will highlight units clearly that have ''your own'' active Heal over Time spells. Regardless of how many other heal over time buffs are on the raid members, you can keep track of your own ones and when they expire. 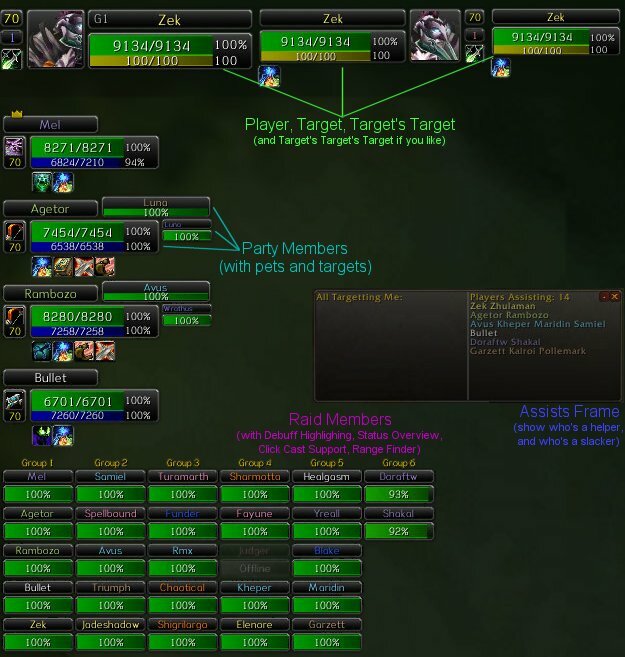 Added '''time left''' on party member/target buffs/debuffs when in a raid, these depend somewhat on CTRA sending appropriate information over the addon channel, although some of it can be determined at run time by X-Perl, when a player gets a buff for example, we know how long it should last, and therefor when it should expire. Totally new options window including all X-Perl options and access via minimap icon and the /xperl splash command. Removed from X-Perl, but continues as it's own standalone Ace mod. In the past if i changed the target there was a sound, is it still working? I see inactive tagged on this project site and latest commits about abandonment, so whatever, since Z-Perl is enough and Resike is working so hard on it, that's it. Late to convo but basically, zek still logs in to cash in off xperl downloads, but contributes no help and doesn't actually fairly share the cash in with the people who've kept it going over years either. Might give like a 20-30% cut to the people who have literally made him money for YEARS doing all the work, on his abandoned addon. It's one thing to pass the torch, but to literally refuse to, then cash in on other peoples work, forking was only logical option for a smart person. Cut off the head and do a fair point distribution all at same time. Once enough users switch to Z-Perl, might see zek pop in to find out why points have a dramatic drop, and all of a sudden he'll fix xperl. Or let it die for good. One or other. So long as people keep updating xperl for him, he'll continue to cash out on other peoples work, and the ones doing that work are the foolish ones. I speak from experience. I used to maintain xperl at end of wrath early cataclysm but I wised up to what was going on and left. Switched to shadowed unit frames and never looked back. This of course is not an attack by any means. X-perl only exists through his original hard work long ago. I can see how it'd be hard to give up something you once upon a time long ago put so much time into. passing torch or letting it die are both hard things, but its just the right thing to do. I can't confirm that X-perl is dead but I CAN confirm that Z-perl works just like X-perl - I switched and can't tell the difference, except that Z-perl actually works and has been stable for me. Is this addon dead? I've been using the oct 14 release and while it works with WoD it is SUPER unstable. I see this PlayerLin guy advertising Z-Perl but I'm a little hesitant to swap off xperl as i'm super used to it and have it configured exactly how I need it. Can anyone confirm if this is a dead addon? Are you tried Z-Perl r891? It edited and pushed to beta today. Under Global options, I would like to use the 'Status Highlighting' - 'My Target' but when I have it selected it does not highlight my target like it did prior to WoD, I have also updated to the latest Xperl version too. Any idea where or how I could fix that, even through the lua? Resike cannot taken over due Zek's account still active so he can only forked to Z-perl with full controlling. I've been following the comments on here and am a little confused. I believe Resike is taking over to update X-Perl or are you moving it to Z-Perl? I have been using this mod virtually from when it first was released. I have no idea how to update/do code etc, but patch 6.0.3 has just come out and already there is a few issues with it. If I can support in anyway other than coding I will. Please advise what any course of action is possibly happening with this addon? Thankyou. I think i fixed this. Mostly thats why it's not a release yet. I moved over to Z-Perl yesterday, and it's working fine for me. Maybe you can try Resike's Z-Perl, based on latest one of X-Perl, maybe I'll abandon X-Perl when Z-Perl go stable and X-Perl still no one want to helps.